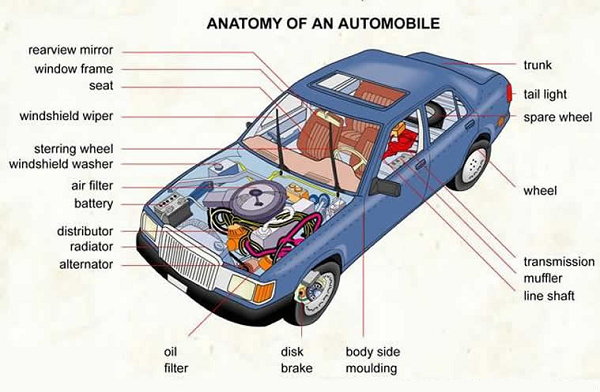 If you’re looking up an article called “Basic Mechanics of a Car” then we’re gonna go ahead and bet that you have absolutely no ideal what the heck is going on under the hood of your car. So we’re going to start with the most basic of basics. 1. You press the gas. The truth is that it’s not exactly space travel. The physics at work are incredibly simple. Building an efficient car engine, a durable car engine, a clean-running car engine, that’s a little more complicated. But the basics are just explosions captured in small chambers, pushing pistons to spin the rear axle. Most cars use disc brakes. The mechanics at play here are so simple that we don’t even need to write a numbered list for it! You push the brake pedal, and it pushes fluid through a tube leading to a set of padded, grippy discs. The discs extend and grip the wheel, slowing it down. Most brakes are attached to the front of the car. This is because, when the car stops, the weight is thrown to the front. Rear brakes are more likely to result in dragging than front brakes. When you ride a bicycle or a motorcycle, you usually use the rear brakes. This is because there’s simply not enough weight on a bike to keep you from flipping head-first over the handlebars and eating asphalt. With most cars this is less of a concern. Most electric cars use some kind of combination of gas and electric power. But assuming we’re talking about a wholly electric car, the mechanics of it are pretty neat: Current is passed through a series of magnets, usually arranged in a circle, in order to create a rotating magnetic field. In the center there will be a magnet attached to an axle, so that when the magnetic field rotates, the axle rotates with it. You’re turning electrical movement into physical movement that you can actually put to work for you. You’ve probably played with fridge magnets and found that they attract, but when you turn one around, they repel one another, right? That invisible magnetic field attracting the two magnets and pushing them away from one another is how electric motors work. Of course, you’ve also found that if you push hard enough, you can force the repellant ends together, right? This is why it takes so much electricity in order to push a car down the road. You’re not going to be able to do that with a couple of fridge magnets, you need a whole lot of force, and a whole lot of electricity in order to generate it. This is one of the reasons why electrical cars tend to be so light. This, in addition to the fact that they do not require the heavy metal engine block that conventional cars use in order to contain the thousands of explosions they need in order to get from point A to point B. The mechanics behind your car’s functions are a lot simpler than you might assume. The tricky part is orchestrating them all to work in unison.